Monotype prints are considered unique prints in that they are not editioned in the same way that a lithograph or lino print would be produced. They are created in a similar way to a drawing on paper or an oil painting on paper. By using this technique an artist can work quickly and smoothly and unlike in drawing, is able to rework and erase areas simply by wiping the ink off the base polymer plate. A monotype refers to the production of a single unique print. For this method, the ink is drawn or painted directly onto the plate and can be wiped off, scratched into and manipulated in many exciting ways. Talcum powder can be scattered onto the surface to create a snowstorm type of effect, stencils cut out of paper can be used to block off areas and the ink can be thinned down with the solvent to "bleed" in uncontrollable and often interesting ways. Monotype allows the artist to explore materials and imagery in a way that often impacts on more "permanent" types of printing. At The Artists' Press artists often use the medium as a way of leading them into what will later develop as a lithograph. Kim Berman, Conrad Botes and Robert Hodgins have found this to be most effective and examples of the results of their monotype prints can be seen on these artists pages. Mark Attwood has developed a monotype transfer process which allows artists to work on a lithograph in almost the same way as they would if they were working with oils on canvas. The artist is able to work in the colour that they want on the print (without having to "abstract" their colours with black ink or litho crayons which is the usual process). Karin Daymond and Judith Mason have made use of this new technique in their editions. "Ghost" prints, which are the print pulled from the plate once the primary image has been printed, can also be used to develop the image further. The "ghost" image is lighter than the first pull and often becomes the base for a new print where the artist works back into the image with ink or oil paint on a reworked sheet of polymer. Robert Hodgins enjoyed playing with these overlays and took delight in where the image would lead him. When Hodgins was working at The Artists' Press on monotypes he liked to have a large arsenal of unlikely materials at his disposal to work with. A variety of toilet paper (each creates a slightly different effect), earbuds, rags, citrus bags and oil paints are always on hand for artists to use. The method allows very clear colour combinations to come through and Hodgins enjoyed the fact that he could use the intense oil colours that he loved so much directly from the tubes. 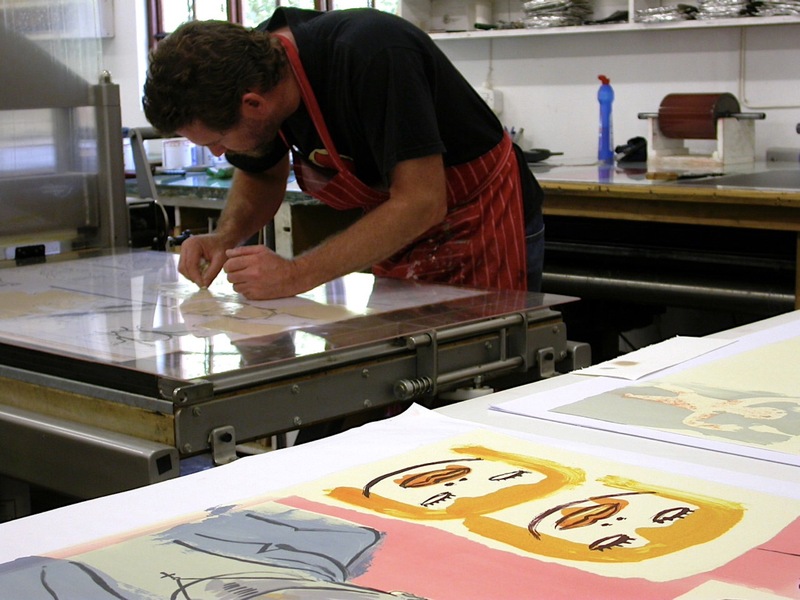 Later ink is mixed to match the "one-off" colours if it is decided to develop a lithograph edition from the print.